Our guest this week is Gino Ferrand, founder and CEO of Tecla, where he helps recruit remote talent for companies. We explore his journey and how remote work is changing the way people work, why it is important, and how we works with companies to integrate remote teams. Our guest this week is Tara Gilboa, who spoke about her journey in education through teaching, instructional design, and studying abroad. Our guest this week is Eric Olsen from Helix Education and host of the Enrollment Growth University podcast! 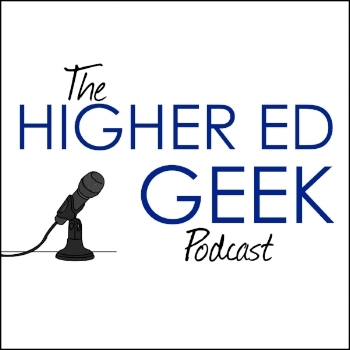 This is a really fun chat exploring marketing, digital education, and the future of higher ed. Our guest this week is Melissa Ruiz from our good friends at Swift Kick! She speaks about her journey to being a speaker, how her college experience at Rutgers shaped her and what’s she working on now to help expand access to high quality fitness experiences. Our guest this week is Anne Trumbore who works with Wharton Online but has a long history working in digital higher education and a unique journey of how she got into the field. Our guest this week is another repeat guest of mine from the SAC podcast days, Kevin Forch! It was great to catch up with Kevin and hear more about his story as he has built his career and family out in Nebraska. Episode #51: Season 3 Premiere! In this episode, we give a brief update on the past few months and what listeners can look forward to this season. In the final episode of this season, we look forward to what we hope for the show next year and what Dustin will be up to during the break.